In our newest dress story we‘re making a return to romantic full dresses with beautiful hand appliques and textured lace embroideries. We take an in-depth look at a dress that’s all about understated elegance, irresistible retro charm and a bold cleavage statement. Essentially we are showing you that if you want the ideal mix of classic and modern you can get it. So, are you ready to meet our retro-inspired wedding dress designed for princess brides with a rebellious and fun attitude? Our Pivoine wedding dress is a chateau fairytale in the making. With an A-line silhouette dressed in the finest floral lace and adorned with precious pearls, this is the perfect dress to wear if you want a look that successfully combines classic with modern to give you the most whimsical air. There’s an irresistible retro charm to this wedding dress and it’s the result of the two-toned luxurious laces, the bouffant double-layered lace sleeves, the pearls adorning the waist and the glam sequins delicately embellishing the lace in all the right places. 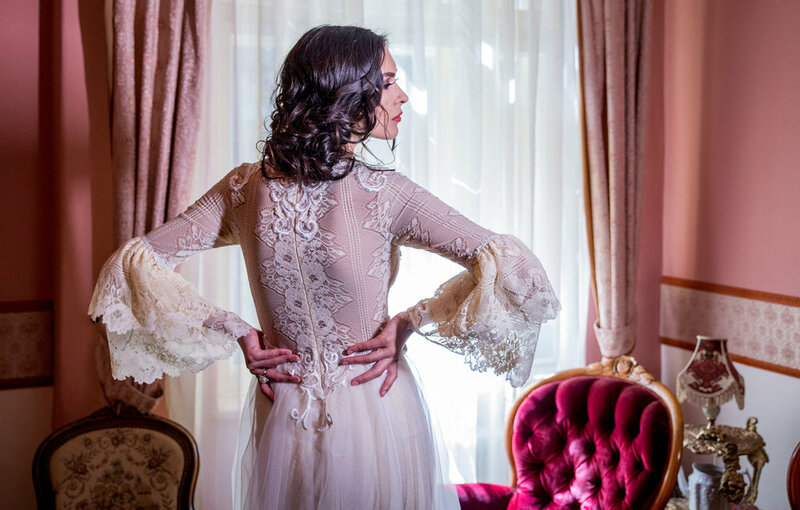 Although Pivoine is a full-length wedding dress, with long bouffant sleeves and lace all over, this is one of the lightest gowns you’ll ever wear. And it’s all thanks to our amazing seamstresses and the swoon-worthy light fabrics. The lace we used on this style is a luxurious, diaphanous experience. It comes in two different shades, each reminiscent of a different period in time, a beautiful color contrast that’s going to come in handy if you’re looking for a wedding dress that isn’t full ivory. Both the lace and tulle are of the highest quality and they hug the silhouette with such irresistible charm, it will make you look and feel like a real day princess walking down the aisle. We’ve heard it before. Brides nowadays don’t want something that’s either classic or modern. These beautiful discerning brides want their dress to have the best of two worlds, in a mix that perfectly matches their fun, elegant and yet, rebellious attitudes. And Pivoine is just the right style to express that. The silhouette in itself is a classic A-line silhouette, with a body-hugging dress but we added a beautiful, modern touch to a timeless classic silhouette with the softest tulle overlay to accentuate the waist. Which also makes the whole dress a lot more playful and dreamy. And now, let’s talk about the centerpiece on this fabulous lace wedding dress: the jaw-dropping cleavage that shows just the right amount of skin to make the dress sensuous but not over the edge. Book an appointment for your wedding dress in our Bucharest showroom and let us help you find the ONE. We offer a wide choice of elegant shapes and necklines, both for bridal and evening, to make sure each woman finds the dress that will bring out the goddess in her heart. Visit us at our headquarters in Bucharest, Romania (Episcopul Chesarie 12) for a chance to see more wedding dresses in our beautiful bridal collection. Contact us here and let's find the most important dress you will ever wear.